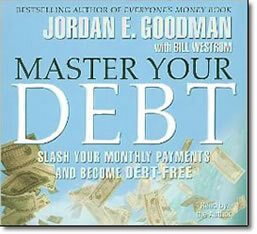 Master Your Debt – by Jordan E. Goodman – CDs or MP3 – Discount! The world of borrowing and debt management has changed dramatically, leaving people confused about how best to secure their financial future. This is the only guide with detailed advice to help you become debt-free or master the debt you have, based on the latest laws and new government programs and policies implemented under the Obama administration. Is the information and advice on debt management different than in years past? Negotiate new terms and payments for burdensome medical bills, student loans, and credit cards. Master new credit card rules, and avoid the rate and fee traps. Learn a revolutionary strategy that will help you become mortgage-free in five to seven years, change the way you pay all your bills, and save you tens, perhaps hundreds, of thousands of dollars. The ﬁnancial marketplace is always evolving, but recent developments have been especially dramatic—a sea change brought about by a credit crisis, a deep recession, and a new administration. Many loan products that were prevalent don’t even exist now, and there are new ones taking their place. There are new credit card rules, new student loan plans, and new mortgage-modiﬁcation programs. Master Your Debt presents many pioneering strategies as it lays out an innovative plan for achieving the elusive goal of financial success. This reliable resource also is filled with helpful Web sites, toll-free numbers, association and government agencies, and vetted companies and services to help you implement the advice offered here. In today’s volatile economy, getting out of debt is the key to surviving and thriving. Now, Jordan Goodman provides you with the strategies and tools to live debt-free. If you want to rebuild your debt life and use of credit from start to ﬁnish, you should read the book from start to ﬁnish; sections are arranged so that the ﬁrst CDs create the foundation for the rest of the program. If you already feel like you are drowning in debt, go directly to CD #5, where most of the emergency advice in this program is located. There you will ﬁnd advice on how to dig out, which bills to pay, and how to hold on to your home. After you’ve looked that over, you can return to the beginning and proceed in order. If there’s one kind of debt that’s at the top of your to-do list now, you can go directly to the section that deals with those particular issues. There are, for example, sections about student loans, car loans, and mortgages. Jordan E. Goodman is a nationally recognized expert on personal finance. He is the author of the bestselling Everyone’s Money Book and twelve other books. For eighteen years, he reported and wrote about cutting-edge developments in personal finance for MONEY magazine and also, for many years, served as a regular commentator for NBC News at Sunrise and Mutual Broadcasting System’s America in the Morning. Today, Goodman appears regularly on many national, regional and local radio shows, as well as on TV programs on Fox, CNN, CBS, CNBC, and MSNBC. He also speaks regularly to large groups such as the Harv Eker wealth seminars. Consider this program the ﬁrst tool to use in your debt mastery program. You can use it in the way that works best for you.